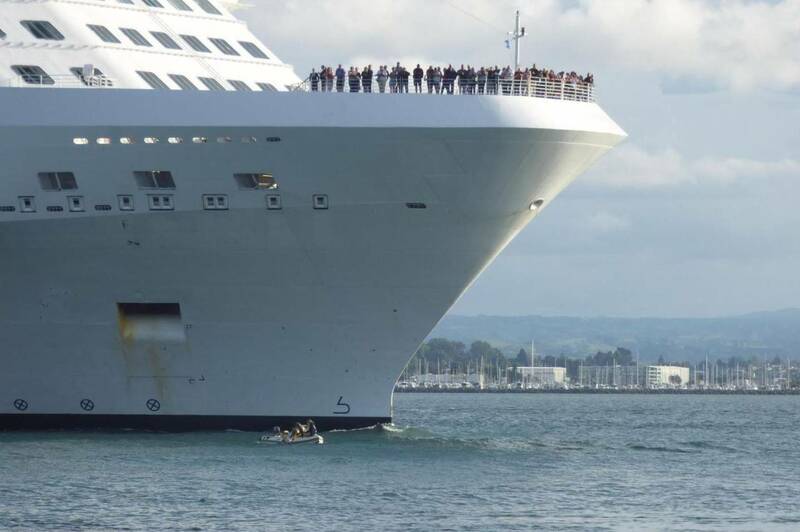 A cruise ship passenger has described the fear she felt as she watched a near collision with a small inflatable boat unfold in Tauranga Harbour. Footage of the December 12 incident in Tauranga Harbour went around the world last week after it was released by the Bay of Plenty Regional Council as a reminder to boaties to stay clear of big ships. The 122,000-tonne Celebrity Solstice had to urgently alter its course in a narrow shipping channel to avoid hitting the incapacitated boat, which had four people on board. A fisherman who raced in to tow the inflatable out of harm's way said they had run out of fuel. Aucklander Jackie Halpin was among passengers on the Celebrity Solstice who watched the incident from the ship's deck. She said she had been cruising for years and had never seen anything like this in Tauranga, a "beautiful port" where there were always smaller craft out. Halpin said she feared for the safety of the people on the boat, concerned the ship would hit them, or that the waves from its wake would turn the inflatable boat over. "[They] were so close that they could almost touch the side of the ship. "They were so lucky that someone went to their rescue. "I just hope the people have learnt a lesson to check they have enough gas and keep eyes open for big ships." She said the cruise ship's captain was "amazing" throughout the incident and let passengers know why the horn was being sounded. Meanwhile, Port of Tauranga chief executive Mark Cairns reiterated the harbourmaster's warnings to boaties about the danger of getting in the way of big ships, all of which are in the control of a Port of Tauranga pilot on board when they enter or leave Tauranga. He said large ships could not quickly change their course or speed. Cairns encouraged boaties to be aware of the rules and check the shipping movement schedule, updated hourly, on the port's website. "Thankfully, incidents of this type are rare but we'd prefer they were non-existent," said Cairns. "At our request, the harbourmaster has prioritised patrols around cruise ship departures to give our pilots increased confidence. This is a really positive outcome." Harbourmaster Peter Buell said the patrols were meeting every ship coming in or out of the harbour and helping to clear errant vessels out of the way. He said the patrol was operating the day of the incident but was on the other side of the ship's path to the dinghy, so could not get across to help it without putting themselves at risk.